Green Pasture, 18" x 14"
Massachusetts artist, Mark Meunier paints stunning still lifes and landscapes, brilliant in color and mesmerizing to the viewer. He works in the mysterious medium of egg tempera. It is a type of paint often feared by artists because of the rules around application and finishing, but it is also a medium that has endured centuries, being one of the oldest mediums ever used. However, Mark has found a smooth and simplified process, working similarly to oil painting and glazing his way to a luminous final work. Mark learned egg tempera on his own, when he found that oil painting wasn't giving him the effects that he wanted. He needed something that dried more quickly, but could still work in glazes. 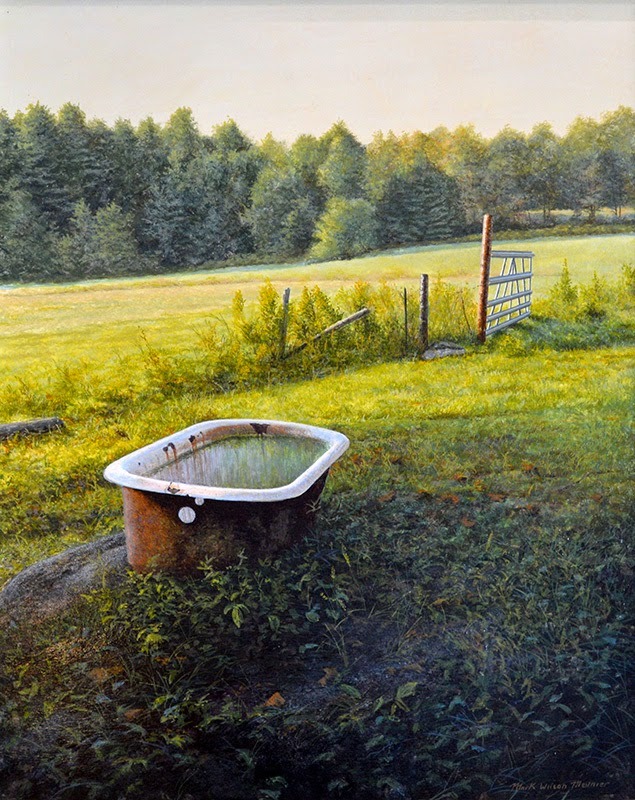 After studying the work of Andrew Wyeth and Robert Vickery, Mark read Vickery's book, New Techniques in Egg Tempera and then began his journey making paint, building panels and refining this technique. Egg tempera is a combination of egg yolk with pigment, each color mixed in turn as it is needed, right on the palette. It needs to absorb into the surface and bind with the surface of the substrate, so it requires a solid hard panel to keep it from cracking when dry and a panel coated with an absorbent gesso. Many artists using egg tempera work with traditional gesso on wood panels. For much of his work, Mark uses small round brushes and has shared his love for the Faux Kolinsky line. With the spring and softness of the brush, it is perfect to hold egg tempera, which has a consistency similar to fluid acrylics. Egg tempera is often applied in cross-hatching method, which also lends itself to round brushes and the full belly on the Faux Kolinsky holds the pigment well. More about Mark's work in egg tempera on the Ampersand Art Supply blog, where I shared some of his work and help to demystify the medium: "Working in Egg Tempera". You can see Mark's work in person in a few Massachusetts galleries. Mark is represented by R. Michelson Galleries in Northampton, MA and by the Collins Gallery in Orleans, MA. Eye of the Tiger series are hand crafted with a special synthetic hair and black short handled, plastic handles with a seamless metal ferrule. Similar in spring to the Faux Sable line, yet a touch softer, these able brushes are great for light water media like watercolor or gouache. These would also work well for soft fluid acrylics in decorative art. At an affordable price, these brushes are ideal for educational use, these come in rounds, shaders, angles, filberts, lines, fans and oval mops as well as in canisters for bulk purchasing.